Last week, I shared with you some of my hard won gardening tips and some of what I’m growing this year. If you missed it, check it out HERE. 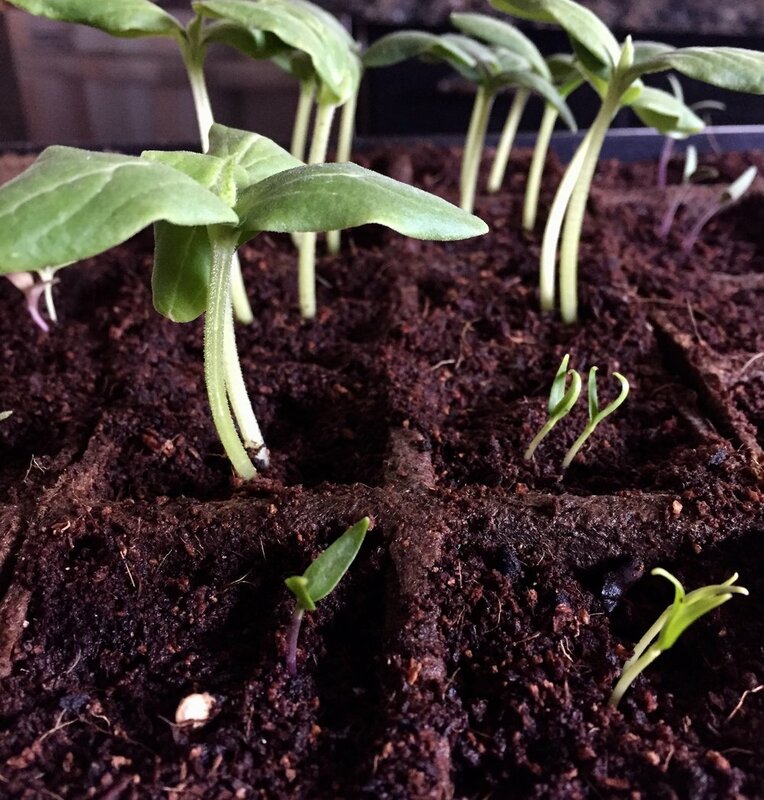 This week I wanted to give you a little garden update on how my seeds are doing and how we are preparing our outdoor raised beds for my little seedlings. This week the seeds have gone from nothing to a burst of tiny green sprouts. It feels as if I went to bed one night and woke up with seedlings! My lettuce was the first to sprout, followed quickly by the cucumber and tomato. The parsley finally poked out a few days ago and last but not least, the bell peppers are just beginning to stretch out of their seed pod. In a few weeks they will be more than ready to transplant outside to really get their grow on, but for now they are happy being shuttled outside when it is nice and inside when the chill is too much. The weather in my area can be a bit unpredictable so having a nice sold base for my seedling pods is key since they do get moved about quite a bit, not only from inside to outside but to different parts of my yard during the day to maximize their sun exposure. We have been slowly began the work to the outdoor garden. Jim has kindly cleared me a large amount of open yard so I can make pumpkin mounds and (hopefully!) grow some pumpkins this year. The years past have given me pumpkins, but they have been accidental ones that have grown out of discarded seeds in our compost pile, a wood pile and even a compost bin one year so I have great hope this year I can grow some “on purpose” pumpkins for a change:) I have cleared out any remaining roots from my plants last year, but have kept the cover on the soil unit we are ready to fertilize and put the soil to good use. This year I am trying to commit 100% to keeping, maintaining and using all of the bounty my garden has to offer. One way I am doing this is by sharing my adventures with you. If I know I need to plan a post every few weeks about the garden then I will have to make sure I’m paying attention to the garden! So thank you in advance for your help in committing to my garden. Now tell me, what (if anything) are you growing this year? Is there anything you want to grow but are nervous or hesitant to try? Shoot me an email or comment on Facebook and let me know!